A congressional panel has voted unanimously to release a Democratic rebuttal to a Republican memo alleging bias against President Donald Trump. The Republican president has five days to decide whether to declassify the 10-page document. The House Intelligence Committee released the Democratic memo, which highlights flaws in the Republican one. The Republican document claimed the FBI abused its power by investigating a Trump adviser. 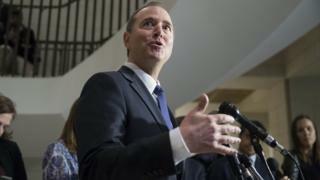 Adam Schiff, who wrote the second memo, welcomed Monday's vote by the Republican-controlled committee on which he is the top-ranking Democrat. The panel had previously blocked release of his document. Republicans, he said, had "found themselves in an insupportable position when they released a misleading memo and refused to release the Democratic response, so I think they were compelled to take the action they did today". The California congressman said it would be "very hard" for the Trump administration now to block its release. What was in the Republican memo? The four-page document centres on court-approved wiretapping of Carter Page, a foreign policy adviser to the Trump campaign, who was placed under electronic surveillance by the FBI. The memo accuses the FBI and justice department of using an unsubstantiated dossier to obtain a court's permission in October 2016 to eavesdrop on Mr Page. The so-called Steele dossier was compiled in an attempt to dig up dirt on Mr Trump, partly funded by the campaign of his rival, Hillary Clinton. The Republican memo says the dossier's author, former British intelligence agent Christopher Steele, told a senior justice department official he was "desperate" for Mr Trump to lose the White House race. The memo says all this represents "a troubling breakdown of legal processes established to protect the American people from abuses". The memo was top secret, but was approved for release by the House Intelligence Committee a week ago and by Mr Trump on Friday. The Democratic memo goes to the White House on Monday night, and the president has until Friday to formally declassify it. Democratic Senate leader Chuck Schumer has written to Mr Trump saying it was a matter of "fundamental fairness" that the president approve the declassification of the memo. Mr Schumer urged the president to demonstrate the Republican memo was not a ruse to discredit the ongoing justice department inquiry into alleged Russian interference in the 2016 election. The senator's letter said if the Democratic memo is not released it "will confirm the American people's worst fears". Mr Schumer argued "that the American people be allowed to see both sides of the argument and make their own judgements". The White House has expressed openness to the release of a partially redacted Democratic memo, according to The Hill. However, the Republican president attacked its author Mr Schiff publicly on Monday. Two hours later, Mr Trump tweeted his support for Republican congressman Devin Nunes, the author of the Republican memo. 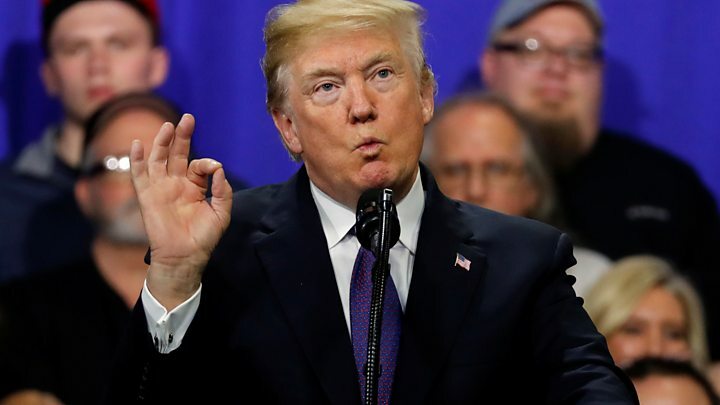 Mr Trump has said the Republican memo, which he declassified on Friday, "vindicates" him in the Russia inquiry into whether anyone connected with his campaign colluded with alleged Russian attempts to influence the 2016 US White House race. But that assertion has been disputed by several Republican congressmen. Republican Congressman Trey Gowdy, who helped write the Republican memo, told CBS programme Face the Nation on Sunday: "There is a Russia investigation without a [Steele] dossier." He expressed "tremendous respect" for and trust in the FBI and the Department of Justice.